Meet Brother William in the Scriptorium at Bradwell Abbey. This Sunday September 9th, 11am to 5 pm, come along to a Medieval Family Fun Day at Bradwell Abbey, Milton Keynes, where Gill and I will be hard at work in the scriptorium. We have been busying ourselves all this week making pretty bookmarks and cards on which to write Your name, or whatever else you would like, bamboo pens and double pencils for You to try, and getting together some original works, prints and doodles hoping that you will dig deep enough into your pockets to tempt me to throw off these monkish robes. I am hoping to find time to give hourly demonstrations of double pencil alphabets. I shall be asking for donations for the Pilgrim Badges (above). These, plus ten percent of any profits I make on the day are earmarked for the upkeep and restoration / preservation of Saint Mary’s Chapel. I shall look forward to seeing all my Fb friends and Bill’s Space visitors. Don’t hesitate to tap me on the shoulder and let me know you are there. If you can’t make it, never mind, I shall post details and pics in the next week or so. 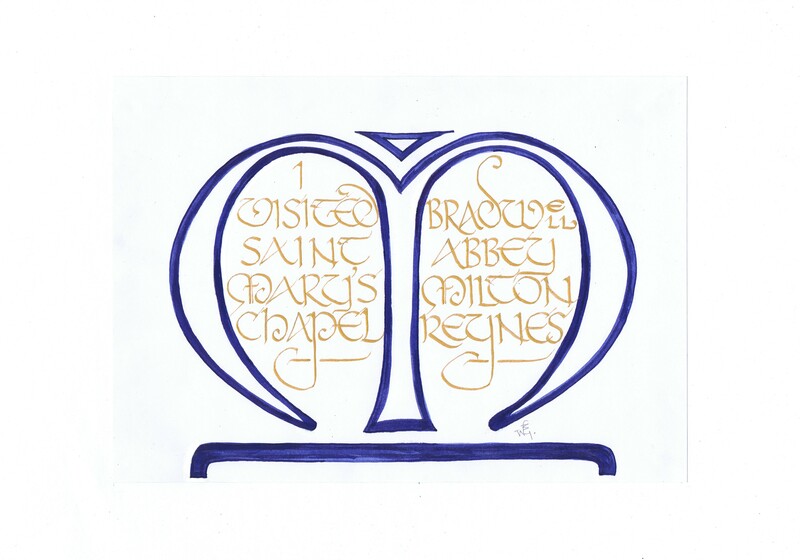 This entry was posted in CALLIGRAPHY,CALLIGRAFFITI,LETTERING,HOW TO and tagged Archaeology, arts, Bradwell Abbey, calligradoodles, calligraphy, Milton Keynes, pilgrim badges, St Mary's Chapel. Bookmark the permalink.